Packing Machine Supplier Malaysia - Yutaka Sdn Bhd. Yutaka incorporated in year 1983 is proud of its long tradition as a competent business partner evolved over the years to offer services and products that meet the needs of today’s industries. With our extensive knowledge and expertise, Yutaka is a leading solution provider globally for packaging. Yutaka is one of the most trusted supplier and is one-stop service provider which specialize in packaging machine serving a vast array of industries. We have ability to generate unique and creative solutions for design decision making, performance and cost-estimating construction planning, integrated service delivery patterns which encompasses everything from design and procurement through to supply, installation, integration, commissioning and testing. Our company has gained an excellent reputation with our customers based on our efficient chain of production, processing, distribution and servicing. 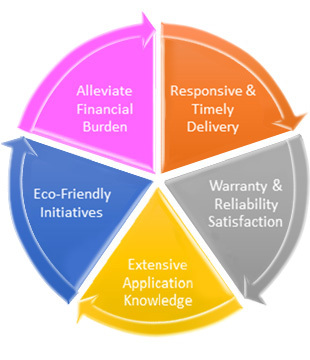 Our unique characteristics are., we give our clients good quality, competitive rates, considering our customer demands and many long-standing relationship with them. These relationships enable us to guarantee a reliable and quality supply of our products to our customers. A leading complete solution provider globally. To achieve each & individual customer satisfactory and bring the business of our customers to success in the spirit of a true “win-win” partnership.